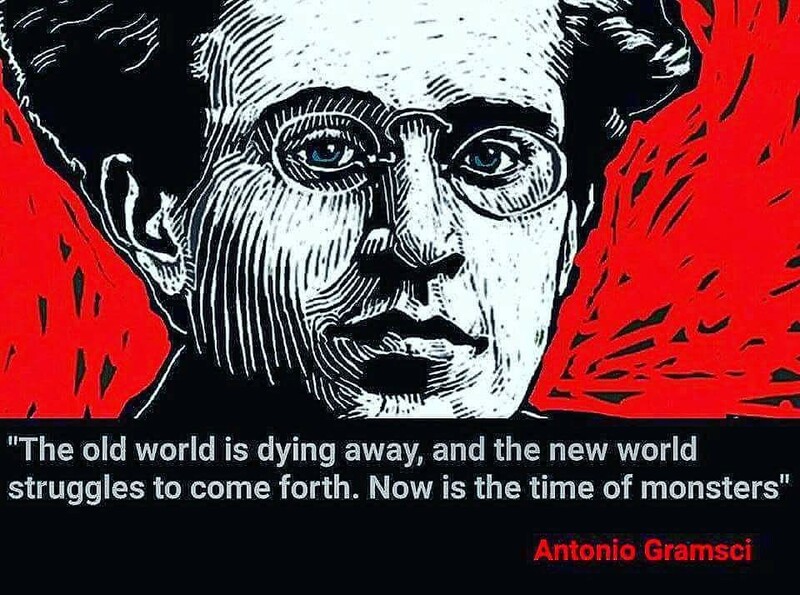 Marxist philosopher Antonio Gramsci didn’t agree with Karl Marx on one key thing: Marx believed that a revolution of the masses from capitalism into socialism was an inevitability in developed societies. By the mid 20th century, Gramsci noted that in the most advanced nations, no such revolution had occurred. Capitalism was entrenched in the US, the UK and most of the West. For Gramsci, this entrenchment of capitalist values was not simply an act of force by the state, but one of ideology. He asserted that capitalism as an ideology was being reinforced and propagated by the bourgeoisie as “common sense” in order to ensure that it remained the status quo — a hegemony over culture. In other words, so long as the capitalist rulers had dominion over the cultural concepts of normality, civility, naturality; socialist and other ‘outsider’ ideas could never break through into legitimate public discourse, because they would be seen as the antithesis to these desirable values. Gramsci believed that for socialism to ever “win” it must first conquer the culture — the hearts and minds of the proletariat — in order to establish its own hegemony. Looking at recent history as objectively as possible, we can see a shift in the cultural hegemony in action. Towards the end of the last century, the idea that socialism could ever establish its own cultural hegemony seemed absurd. Middle-way, neo-liberal politics reigned supreme. Then in 2008, in the aftermath of the global economic crash, things changed. First, Occupy, though not explicitly socialist, certainly brought into the public consciousness the idea of regulation and wealth redistribution. Then, from the ashes, real socialist political parties and movements began to form and even succeed electorally — Podemos in Spain, Syriza in Greece — in a way that had seemed inconceivable just a decade previous. In the UK, this has culminated in Jeremy Corbyn, ostensibly a card-carrying socialist, becoming the leader of the previously barely-soft-left Labour Party, and moving the party leftwards as a result. Bernie Sanders, and more recently, Alexandria Ocasio-Cortez in the US, are symptomatic of this shift, even in the epicentre of capitalism itself. What has caused this political culture shift in recent times? Social media and the internet, most likely. The availability of information online that allows individuals to make up their own minds, to investigate alternative ideas and systems, free from the bias of a press intent on maintaining the capitalist cultural hegemony, means that previously non-legitimised concepts can break through. Movements can grow and achieve virality in an instant, too. Gramsci would see this as retribution; the necessary acquiring of cultural legitimacy by the socialist left. The issue with this narrative is what is happening on the other side. While there has been a boom in socialist ideas since the turn of this decade, if we’re honest, the real winners have been the populists and the alt-right. There’s an interesting discussion to be had here, too. In the UK, for example, many put the popularity of Corbyn down to his populist posturing and rhetoric more than his true adherence to the principles of socialism. So rather than a socialist revival, perhaps we’re instead simply seeing an emergence of the populist politician, grasping hold of whatever ideology they deem politically salient? I think this does a disservice to Corbyn, Sanders and their ilk, who I believe genuinely are socialists and want to advance that cause over any personal agenda. So what of the other side? Certainly, on first glance, Trump and Brexit don’t appear to be evidence of a Gramscian cultural takeover from the left. Yet, actually, perhaps these movements are the greatest testament to these Gramscian ideas coming to fruition. Gramsci makes no predictive judgment on cultural hegemony, in the sense that he doesn’t suggest it’s inevitable or destined that socialism will become the dominant culture. Instead, he suggests merely that if socialism is to become the dominant culture, it must fight on all fronts — not simply within the confines of the political and economic square — but in technology, entertainment, everything. There is little on which Jordan Peterson and I agree, but his suggestion that universities have become hotbeds of liberal, left, ideology is I think, somewhat true. Where we once again diverge, is that I believe it is both a good thing and fundamental to any possible shift in the cultural hegemony. Because while the left may have the universities, and perhaps the entertainment industries… the right has the bulk of the media, business, finance, law and politics. But because of what universities represent, and facilitate, this cultural battlefront is one of the most important. Unlike Peterson, I believe that those who have attended university during this time of left-dominance are actually far more open-minded and questioning than even their parents. And this means that now, coming of age in a society that appears fucked in every direction, these minds are now open to alternatives to the capitalist status quo. And these minds are the ones starting to get the power to make changes. Ocasio-Cortez is 28. She may be in the minority right now, but she is the first of a coming onslaught of new, younger, more left-leaning minds at the top table — and this is as a direct result of the cultural hegemonic shift that has been occurring for at least the last decade. The emergence of the alt-right, Brexit and Trump, then, can be seen as the final throes of the current system. Far from the revolutions they’re billed as, they’re instead simply the existing models taken to their most extreme, in an attempt to quash the ever-building resistance they see to the current capitalist status quo. Hence why you see previously somewhat more rational, tempered forces — the Republicans in the US, the Conservatives in the UK — throwing their weight behind the extremities of their political agenda, in a belief that doing so will re-stabilise the political culture towards the 20th century western model. Instead, it is about to break. Trump and Brexit are what will kill the system, both politically, and culturally. It might take more, even, but they are certainly the beginning of the end, at least. The existing capitalist cultural hegemony is almost dead. You may think it is the right, the populists taking its place. It’s not. See the bigger story bubbling away, the undercurrents of those coming to power through the lens of what they’ve experienced and learnt, and take a pinch of Gramsci as a tonic, and believe me, you’ll see a whole new cultural hegemony brewing — one far more socialist than we’ve ever seen in the west. Jackson Rawlings is a political philosopher, writer and thinker with some big ideas about how we can change the world for the better. Writing words about politics, mostly, and hoping they appear in the right order. Politics chat while the world burns.